A “fit out” is the process of making any space suitable for occupation. A commercial fit out is for a work space as opposed to a residential space. Work stations and office furniture. The earlier we are involved in a project the better. For instance, we can save our clients a lot of time, money and stress if we are brought in prior to choosing the property to purchase or lease. Our experience with literally hundreds of different fit outs offers you invaluable information often not divulged or even known by the property agent. If leasing, it is imperative to read your lease as there may be fit out inclusions and exclusions. The landlord may pay for part or all of the fit out and they may request that you “make good” at the end of your lease. How do you know what budget to set aside for the project? 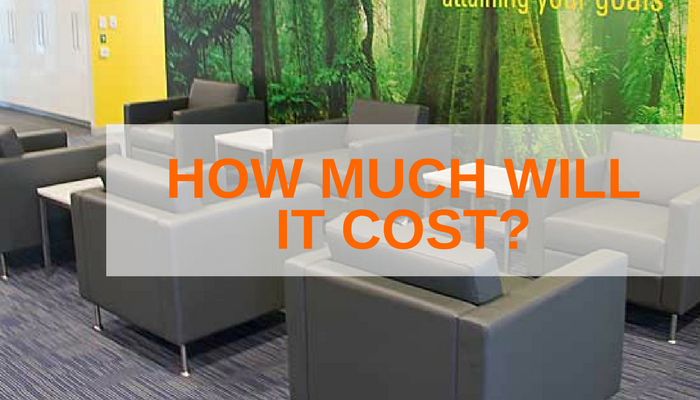 To answer the first question, we have created a price guide of office fit out costs here. a. The actual space you have to fit out. The NLA (net lettable area) often differs considerably from the actual usable office space. For example, 10 columns at .6m x .6m each would equate to an overall reduction of usable space by 3.6m2. b. How many square meters per person do you need for an office refurbishment? The answer to the second question comes down to the processes and integrity of your commercial fit out contractor.The more detailed your quote, the more you know and the less surprises (by those hidden extras). There are a lot of inexperienced (or unethical) commercial fit out operators in the industry who may wow you with the lowest quote simply to get the business. These quotes will invariably be very slim on detail and very full of “fluff”. Experienced and ethical fit out companies are transparent with their costs and potential variations (variations are costs due to the client changing their mind or upgrading/downgrading services, fixtures and fittings) at every stage of the fit out. Our advice would be to steer clear of lump sum or overly simplistic quotes. Even if they look good at decision time, you will feel differently when the price blows out on completion.